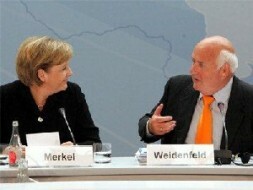 Prof. Werner Weidenfeld, Director of the Center for Applied Policy Research (C•A•P), here with German Chancellor Dr. Angela Merkel:"The Euro will survive the next 10 years as every other option would be an act of charlatanry and makes the Europeans a plaything of the global market." Professor Werner Weidenfeld, Director of the Center for Applied Policy Research (C•A•P) at Munich's Ludwig-Maximilians-University, is one of Germany's top experts on European affairs. Hubertus Hoffmann: How could such a critical European crisis occur, almost out of the blue? What went wrong? Werner Weidenfeld: The EU lacked the capability to confront this challenge, because there were no adequate structures or procedures for crisis-management in place on a European level. As the result of a difficult learning process since the Treaty of Maastricht, such a framework is being established in an ongoing step by step process. It will take at least another five years until we have real economic government in the European Union. Hubertus Hoffmann: Will the Euro survive the next 10 years? Werner Weidenfeld: Yes, every other option would be an act of charlatanry and would make the Europeans a plaything of global markets. Hubertus Hoffmann: Should productive Germany pay, with transfers of billions of Euros, for weak European countries like Greece or Portugal? How much and for how long? Werner Weidenfeld: These are no charity payments; instead, it is an act of European solidarity in pursuit of common European interests. Hubertus Hoffmann: What should the EU do in foreign affairs? Werner Weidenfeld: Important as this Euro crisis and its consequences for the future of the European Union are, we must not forget that it is not the only policy arena where the Europeans have to take action. For instance, the EU also has to consider its obligations in the international arena and should make use of the new mechanisms and institutions it gained through the Treaty of Lisbon. Only a European Union that does not confine itself to introspection will be able to live up to the expectations of the European people. This WSN newsletter is dedicated to Hans Graf Huyn, former diplomat and member of the German Bundestag for the Bavarian CSU, author of several books and a brilliant analyst in foreign affairs, a noble man and paragon of character and convictions.